Ok, so really, I’m pretty sure this is getting a little out of hand. With the strawberries. With the loaf. Between my Chocolate Covered Strawberry Cupcakes and Strawberry Pound Cake, I’m definitely on a roll. Yes, I did throw in a dinner and brunch idea in the last couple of weeks, but for some reason, I just can’t stay away from the strawberries! Anyone else just nomming up these gems as they come back in season? This is what happened. I told myself I needed to take a break from the strawberry recipes and get something else thrown in the mix for the sake of not boring you to death! Then last Sunday, I was looking for some inspiration for what to do with my brown bananas. 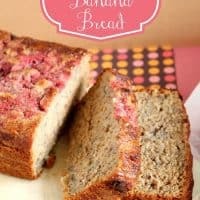 I didn’t really want to make plain ole banana bread, but at the same time, there’s just something so comforting about banana bread, that I was kind of leaning toward it. 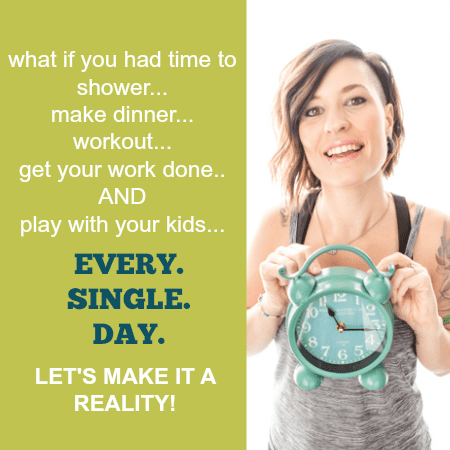 That very same afternoon, I happened upon across Artsy Fartsy Mama’s roundup of 30 Banana Recipes, and I knew as soon as I saw it, what I would be making. The Best Banana Bread it was, and that’s what I was set out to make. But then something happened… my food blogging wheels started turning. And that’s when it hit me… STRAWBERRIES! And that is when I proceeded to try to pound the idea out of my head since I’d just posted what seemed like a billion strawberry recipes. But the amazingness in my head just couldn’t be undone. I had a plan, and I was going to roll with it. 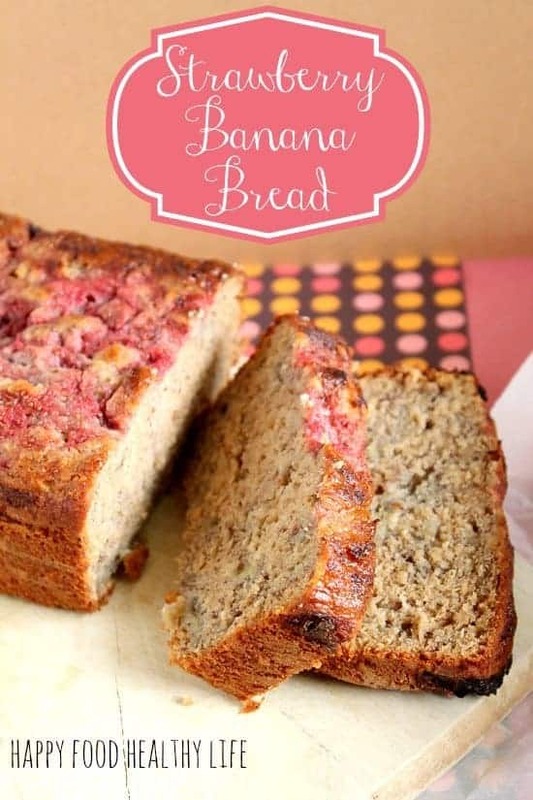 Any that is how Strawberry Banana Bread was brought to life. First off, I do have to say that the Banana Bread itself possibly IS the best banana bread in town. Secondly, when you add swirls of fresh strawberry puree to the batter, oh man, be ready for a party in your mouth. I wish the swirls showed up better in the batter once baked, but it seems that most of the color stayed near the top, and makes a nice natural glaze. I was happy to find though, that the bursts of strawberry flavor are scattered throughout the entire piece. 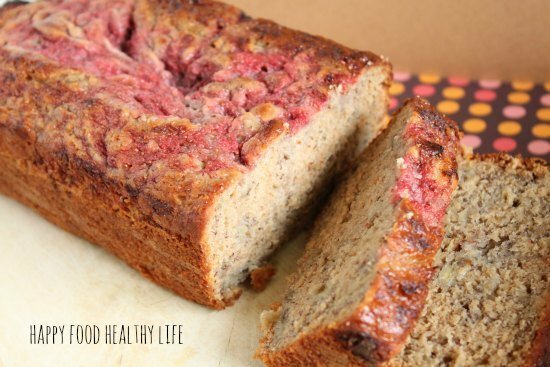 I hope you try this amazing spin on banana bread, and I hope you will forgive me for yet another strawberry recipe. And I wish I could promise you that it will be my last for awhile, but dang, these berries just have me addicted! Preheat oven to 350F. Prepare 8 1/2 x 4 1/2-inch loaf pan with cooking spray/butter/or oil and a dusting of flour to coat. Start by preparing the strawberry swirl. In a food processor, puree hulled strawberries with sweetener or sugar until completely smooth. Set aside. In medium bowl, combine the flour, baking soda, salt, and cinnamon, stirring with a whisk. Place sugar and butter in a large bowl, and beat with a mixer at medium speed until well blended (about 1 minute). Add the eggs, 1 at a time, beating well after each addition. Add the banana, yogurt, vanilla extract, and almond extract; beat until blended. Add flour mixture; beat at low speed just until moist. Spoon batter into prepared loaf pan coated with cooking spray. Top with dollops of strawberry puree and swirl into the batter with a knife. Bake for 60-70 minutes or until a wooden pick inserted in center comes out clean. I support your strawberry addiction =) This looks deeelish! Thanks Tanya! these flavors really do go perfectly together! Oh, i’m SURE I’ll find another use for another carton of strawberries! Oh I SURE will! Thanks Heather! thank you so much Genie! Do us all a favor and keep up with your strawberry obsession. PINNED! Oh my goodness! I love this Holly! It looks incredibly! Thank you thank you… it was gone in about a day in our house! YUM! Hey, I’m wondering instead of making the strawberries into a puree, if you could just add them as chunks?